The Geovision Surveillance DVR's are capable of controlling PTZ cameras via the on-screen interface. The PTZ cameras can be manually controlled as well as set to predefined tours. To use a PTZ camera with the Geovision Surveillance DVR system you will need either a GV-NET card or a GV-COM box. They allow an RS-485 cable to be run from the PTZ to the GV-System for control of the PTZ. The instructions below explain how to set up a PTZ camera on a PC based Geovision Surveillance DVR. 1. If you are using a GV-COM box, connect the RS-485 + and - from the PTZ to the back of the GV-COM box. Then connect the USB port to a USB port on the GV-System PC. (Shown Below) Now move to step 2. 1. If you are using a GV-NET card, insert the card into an empty slot on the PC's motherboard. Then use the 4-Pin Mini Power Cable to connect the GV-NET card to the PC's power supply. Once installed, connect the RS-485 + and - cables from the PTZ camera to the GV-NET card. Now refer to page 2 of the GV-NET Guide for connection setup. (Shown Below) Now move to step 2. 2. Click the Configure button, then select Accessories. Then select PTZ Device and select Add / Remove PTZ. The menu below will appear. 3. Now select the protocol of the camera you are using. 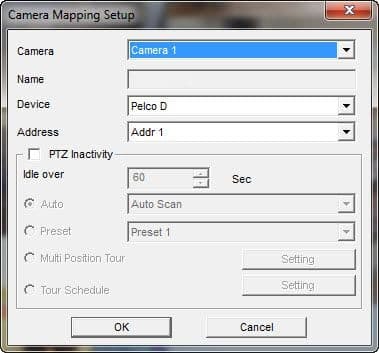 (Note: Most PTZ cameras use the Pelco D protocol) This can be found on the boot screen of the PTZ. 4. Once you have selected the correct protocol press the button, then click OK and restart the GV-System. 5. After the GV-System has restarted, click the Configure button, then Accessories and finally PTZ Device. The menu below should appear. 9. After the PTZ cameras are added to the GV-System, you should see the PTZ Control button. Click the button to enable the on-screen control panel as shown below. 10. From the menu above, you will be able to control all the functions of your PTZ camera.